This example explores how to simulate correlated counterparty defaults using a multifactor copula model. Potential losses are estimated for a portfolio of counterparties, given their exposure at default, default probability, and loss given default information. A creditDefaultCopula object is used to model each obligor's credit worthiness with latent variables. Latent variables are composed of a series of weighted underlying credit factors, as well as, each obligor's idiosyncratic credit factor. The latent variables are mapped to an obligor's default or nondefault state for each scenario based on their probability of default. Portfolio risk measures, risk contributions at a counterparty level, and simulation convergence information are supported in the creditDefaultCopula object. This example also explores the sensitivity of the risk measures to the type of copula (Gaussian copula versus t copula) used for the simulation. The portfolio contains 100 counterparties and their associated credit exposures at default (EAD), probability of default (PD), and loss given default (LGD). Using a creditDefaultCopula object, you can simulate defaults and losses over some fixed time period (for example, one year). 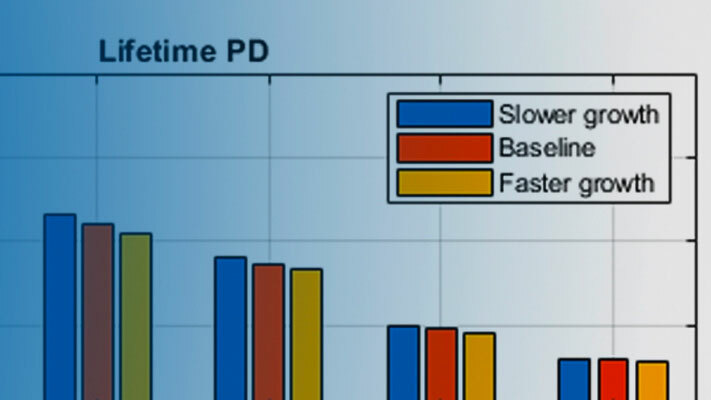 The EAD, PD, and LGD inputs must be specific to a particular time horizon. In this example, each counterparty is mapped onto two underlying credit factors with a set of weights. The Weights2F variable is a NumCounterparties-by-3 matrix, where each row contains the weights for a single counterparty. The first two columns are the weights for the two credit factors and the last column is the idiosyncratic weights for each counterparty. A correlation matrix for the two underlying factors is also provided in this example (FactorCorr2F). Initialize the creditDefaultCopula object with the portfolio information and the factor correlation. % Change the VaR level to 99%. Simulate the multifactor model using the simulate function. By default, a Gaussian copula is used. This function internally maps realized latent variables to default states and computes the corresponding losses. After the simulation, the creditDefaultCopula object populates the PortfolioLosses and CounterpartyLosses properties with the simulation results. The portfolioRisk function returns risk measures for the total portfolio loss distribution, and optionally, their respective confidence intervals. The value-at-risk (VaR) and conditional value-at-risk (CVaR) are reported at the level set in the VaRLevel property for the creditDefaultCopula object. Look at the distribution of portfolio losses. The expected loss (EL), VaR, and CVaR are marked as the vertical lines. The economic capital, given by the difference between the VaR and the EL, is shown as the shaded area between the EL and the VaR. % Overlay the risk measures on the histogram. % Shade the areas of expected loss and economic capital. Find the concentration risk in the portfolio using the riskContribution function. 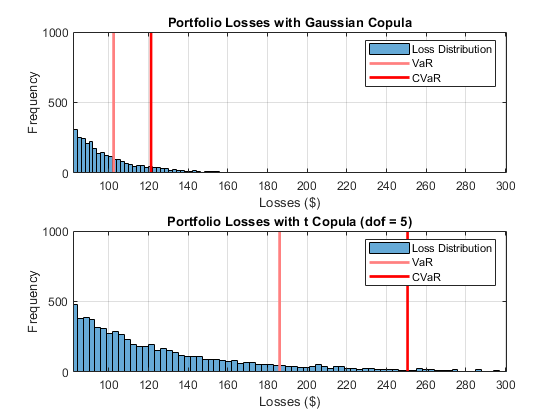 riskContribution returns the contribution of each counterparty to the portfolio EL and CVaR. These additive contributions sum to the corresponding total portfolio risk measure. 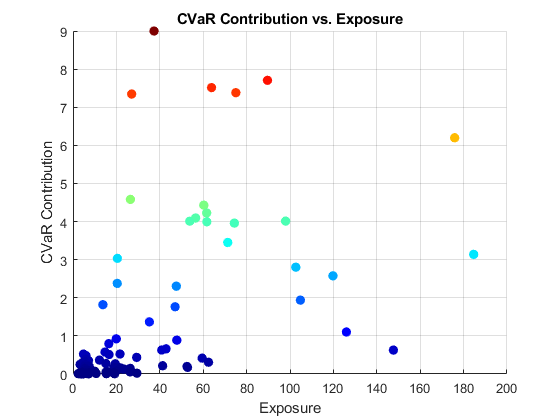 % Risk contributions are reported for EL and CVaR. Find the riskiest counterparties by their CVaR contributions. Plot the counterparty exposures and CVaR contributions. The counterparties with the highest CVaR contributions are plotted in red and orange. Use the confidenceBands function to investigate the convergence of the simulation. 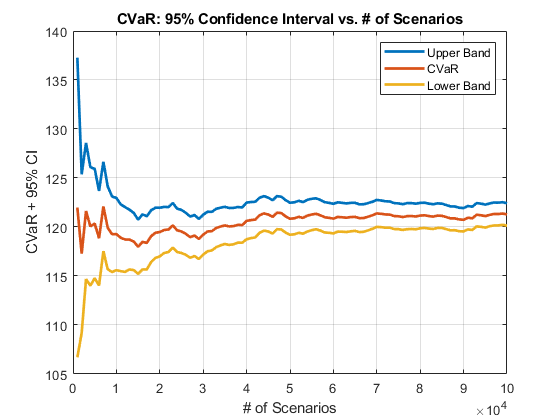 By default, the CVaR confidence bands are reported, but confidence bands for all risk measures are supported using the optional RiskMeasure argument. % The confidence bands are stored in a table. Plot the confidence bands to see how quickly the estimates converge. 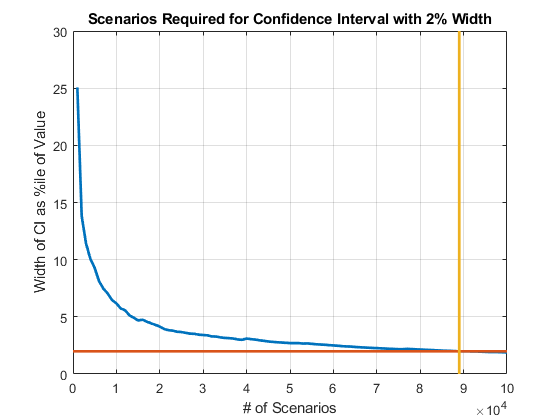 Find the necessary number of scenarios to achieve a particular width of the confidence bands. Switching to a t copula increases the default correlation between counterparties. 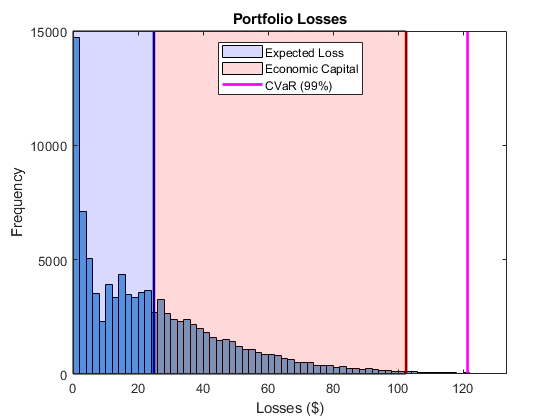 This results in a fatter tail distribution of portfolio losses, and in higher potential losses in stressed scenarios. Rerun the simulation using a t copula and compute the new portfolio risk measures. The default degrees of freedom (dof) for the t copula is five. See how the portfolio risk changes with the t copula. Compare the tail losses of each model. % Plot the Gaussian copula tail. % Plot the t copula tail. The tail risk measures VaR and CVaR are significantly higher using the t copula with five degrees of freedom. The default correlations are higher with t copulas, therefore there are more scenarios where multiple counterparties default. The number of degrees of freedom plays a significant role. For very high degrees of freedom, the results with the t copula are similar to the results with the Gaussian copula. Five is a very low number of degrees of freedom and, consequentially, the results show striking differences. Furthermore, these results highlight that the potential for extreme losses are very sensitive to the choice of copula and the number of degrees of freedom.